An all-star cast in a film about Bonnie and Clyde is never about the famous outlaws, but rather the pair set to end their crime spree across several states. 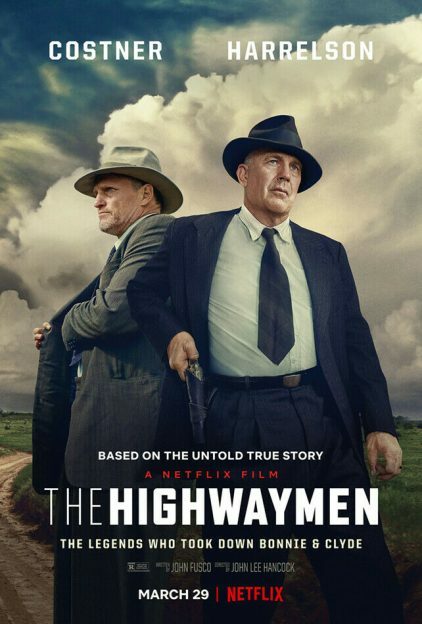 A rather sluggish script hinders any intrigue as The Highwaymen becomes a docudrama rather than anything interesting. Set in 1934 as Bonnie and Clyde bust out some friends from a Texas work farm, Gov. Ma Ferguson (Kathy Bates) is desperate and agrees to a plan to hire former famous Texas Rangers Frank Hamer (Kevin Costner) and Maney Gault (Woody Harrelson) to hunt them down and kill them. While the FBI use wire taps and try to slow the duo down, they follow their gut to head them off in Dallas. Bonnie and Clyde’s carnage continue as Hamer and Gault are always playing catch up, eluding the hindrances from the Feds. Netflix hired John Lee Hancock (The Blind Side, Saving Mr Banks) to helm the biopic from a script by John Fusco (Young Guns, Hildago, Marco Polo TV series). We can’t blame the two main stars for a misguided script and project, which should have been called Hamer & Gault. Faceless and forgettable characters come and go: John Carroll Lynch’s Lee Simmons, Kim Dickens (Fear the Walking Dead) as Hamer’s spouse, Gladys and William Salder as Clyde’s father, Henry Barrow. 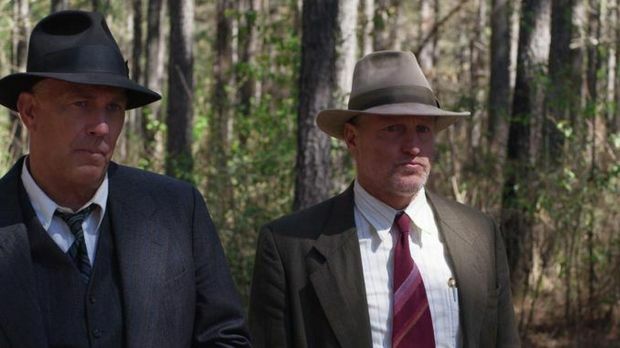 The real tragedy here is that Bonnie and Clyde are the real life Natural Born Killers, which starred Harrelson, but The Highwaymen offer zero intrigue in the chase. There is an interested chase across a dirt pasture as the cars do donuts, leaving them without any vision, yet there is NO suspense, NO gunshots to a window as the criminals just get away. Costner and Harrelson deliver fine performances about two characters seeking out emotional permission to be monsters…to be killers…to justify the pending confrontation and execution of the Natural Born Killers. It’s tragic that Bonnie and Clyde’s criminal escapades could seem this dull.